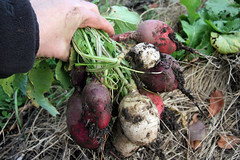 I picked Raphanus sativus, the lowly radish, as my best crop of 2008. And I made a Year of the Radish award button to add to my sidebar. Congratulations to the Radish!!! Radish: Well, this has to be my crop of the year. Mainly because I have tried and tried to grow radish for many many years. I'd get plants with skinny little roots, lots of root worms. Not this year. 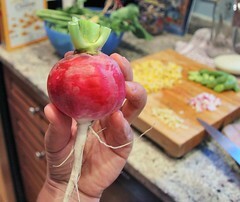 I had radish all season long. Big ones and little ones, red ones and whites and pink ones. It was ones of my first and my last crops. I still have a dozen in my fridge - the only vegetable left from my garden. 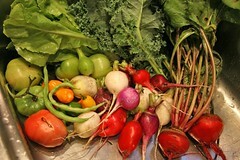 I think the difference this year was growing them in the full sunlight of my new community garden plot. I have to conclude that radish need more sun than my side yard has. 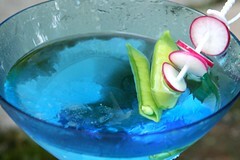 Too bad there's not much you can do with radish - but I still think they are great in a martini! Next year I am looking forward to more Easter egg radish and trying some French breakfast and Misato rose radish. 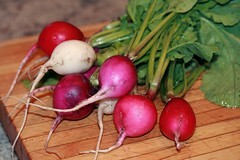 I tried radishes for the first time this year and had the same troubles you did for awhile. I'll have to try more sun and see if it makes a difference! This was my year of the lettuce. I had the most beautiful lettuce. Well until mid July anyway. I could have called it the year of the zucchini, but isn't every year zucchini heaven? I had one beautiful, globular, red radish, worthy of a veggie centerfold--and the rest were pathetic woody little things, not even fit for pests. A fall planting fared no better. Poor sunlight could be the culprit, thanks for the tip and congrats on your crop! Its tough to get lettuce all summer. I'm going to try for that again this year. Same with me on the zucchini. It didn't seem fair to say the summer squash was the winner. They are always prolific. Although, mine had much less trouble with stem borers this year, which was really nice.